The Komodo LabVIEW Driver is a free and open-source LabVIEW Instrument Driver for the Komodo CAN Interfaces. This version supports LabVIEW 2017 and above. Support Question of the Week: How Do I Communicate to the Komodo CAN Duo Interface with a Graphical IDE other than LabVIEW? 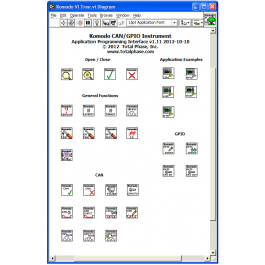 Support Question of the Week: How Do I Clear the Saturated Buffer When Using the Komodo CAN Duo Interface?